← Read–Plant– Water– Repeat. Books to share in the Garden. Ahhhh…summertime, and the livin’ is easy. Or should be. Never mind that it’s still cold and most of us have to continue working (although I gave up substitute teaching in the summer a few years ago. Unairconditioned schools and I don’t get along.) Even though most parents work in the summer most still find it possible to carve out time for some kind of warm weather fun. For many of us, that means going “up north.” Of course, “up north” does not have to be north. It can be anywhere you find a crystal clear lake for canoeing, a cabin with a porch facing west, and a nighttime sky glowing with that wide swatch of white we call the Milky Way. Here are three books that will transport you to another place, whether you’re destination is near or far. Stay tuned for more reviews in the coming days. Up North at the Cabin by Marsha Wilson Chall, paintings by Steve Johnson. Lothrup, Lee and Shepard Books, New York, NY, 1992. This is my favorite summertime book. In beautifully crafted, poetic language, it describes clearly what going “up north” meant to my family. Every year, from the time our children were in diapers, we found time to spend at least a little time in Northern Wisconsin. Once they were not much older we found the perfect resort and went back for a week, year after year. The owners even put our name on “our” cabin. The last two pages are the most meaningful for me. The young girl is packed and ready to go home. She looks all around at everything and “I shut my eyes tight and fix them in my mind. So when I’m far away from summer, when frosted windows cloud the sun, I close my eyes and once again I am up north at the cabin.” The painting shows her with a small suitcase, walking out the cabin door, looking back wistfully. A parent in the background packs the trunk of the car. The painting needs no explanation. Her backward glance, filled with longing, says it all. Marsha Chall explains that as a child she spent her summers on northern lakes, but that this book was inspired even more by taking her own children there. “My daughter always cries when we leave,” she explains. Yes, I know. Mine did too. 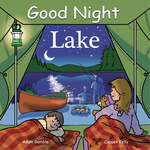 This is a fun board book and perfect companion to Up North at the Cabin for the youngest child. So, if travel includes a baby, bring this one along. It takes the reader through a day of ducks and lily pads, frogs and fish. A summertime dock for friends who swim. Playing in the sand, hiking and looking for bugs. It even includes a day of ice fishing and a walk through autumn woods gleaming with red and gold leaves. And of course, every perfect day ends with a campfire. Didn’t we have Fun! By Hilda Robinson and Jeff Kunkel. Crickhollow Books, Milwaukee, WI, 2012. Hilda’s use of oil pastels gives an impressionistic quality to the paintings. Little girls in freshly ironed dresses, black patent leather shoes and bows in their hair walk through a park on what must be a Sunday. But oh, look. There’s one boy among them in a white suit. Five girls and one boy, Hilda and her siblings, proceed all in a row past an elderly couple on the park bench. Green trees in the background look like lime colored powder puffs. On the next page we see her parents: “My mother…held her head high and let everyone know that her children were the best.” Mama is dressed in her Sunday coat, high heels and hat. “My father…wore beautiful black suits, silk ties and a Panama Hat.” He worked for the railroad and whenever he had spare time would go to the barber shop to talk baseball with the neighborhood men. Page after page depicts a childhood summer filled with family and friends, listening to the radio or just sitting on the front porch if it was too hot to be inside. “Children played on the front steps and sidewalks. Grownups sat in wooden rocking chairs on the front porches and kept an eye on the children. Everyone went ‘Oooo!’ and ‘Ahh!’ when a cool breeze came along.” Children help with the laundry. Sheets and towels sway in the breeze on a clothesline while little girls play beneath them and mother visits with the neighborhood ladies. The painting of six little girls, one holding tightly to a doll, playing hopscotch brought back memories for me. The familiar squares in black with contrasting bright white chalk leap off the page. It will transport readers of a certain age back in time when recess was all about games and no one had a smart phone. Roller-skating, basketball, swinging on swings and hanging from monkey bars depict play from a different time: when most free time was spent outdoors and little bodies got plenty of exercise. I could go on and on. The paintings are gorgeous and the accompanying text evokes a time and place that may be gone forever. But I hope not.